Hopefully your piano has arrived already assembled! If you are using a keyboard at home then assembling it should be very easy. You need a power adapter and a stand for your keyboard. Just plug the adapter into the power plug, switch the power on and off you go! Keeping your piano in tune is one of the most important things when caring for your piano. They can last for a hundred years if tuned regularly, taken care of and repaired as needed. Pianos should be tuned every 6 months (twice a year). New pianos need to be tuned 4 times during the first year. This is because the piano strings have very high tension on them, and they stretch as time passes. Extremely high string tension is what causes the pitch to go flat. 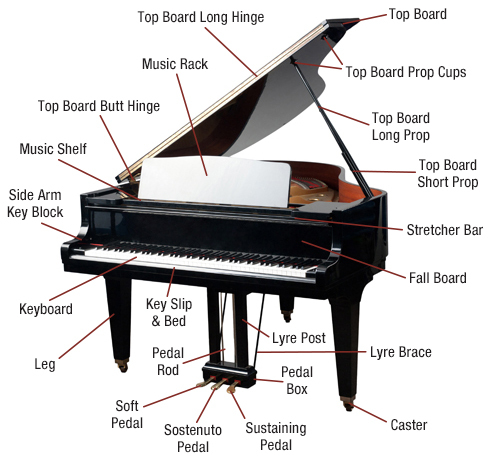 When a piano is in need of tuning, its pitch is compared to a tuning fork, strobe tuner or some standard pitch source. Then pitch raises are given if needed by simply bringing up the string tension one string at a time, until the piano is back in tune. Pianos are mainly made from wood and so are affected by humidity. Your piano’s pitch can go up or down based on the humidity in the room it’s kept in. So be sure to keep the piano in an area that has an even amount of humidity, all year round. Cleaning and polishing are 2 different things – polishing should be kept to a bare minimum. Dust should be removed by a feather duster. Do not use a dry cloth as this will allow the dust to scratch the finish. If you do use a cloth, make sure it is slightly damp (preferably using filtered water) and only use a soft fabric such as flannel or chamois. Never use rags or paper towels. Dry immediately with a separate cloth. Do not dust any exposed areas of your piano’s interior. These parts are very fragile and should only be cleaned by a professional. Avoid placing objects on your piano. If you use a piano lamp, make sure it has a cloth or felt base, or place it on top of some soft fabric. Always check whether your piano has a polymer or lacquer finish before polishing your piano as they must be polished differently. You can purchase the suitable polishing kit from your local music retailer or online. Follow the kit instructions carefully. It is very important to keep wood polish away from the keyboard. Clean the piano keys using mild soap diluted with filtered water and a soft cloth such as cheesecloth, flannel or chamois. Use your slightly damp cloth to wipe keys down towards you (not side by side) one octave at a time, and dry immediately before moving onto the next octave. Cleaning your keys regularly removes the dust and dirt that bind to the keys from sweaty hands and skin oils over time, as well as restores their brilliance. Always close the fallboard to keep the keyboard protected from dust and dirt when your piano is not in use. If you have a keyboard, use a protective cover. Most modern pianos have 88 keys in total. 52 white keys and 36 black keys, which means 7 octaves of notes plus a minor third. It is important to establish good technique when beginning to learn the piano or keyboard as this will allow you to play more efficiently. Good technique will allow you to tackle scales, arpeggios and music at high speeds, with evenness and beauty of tone. When you play the piano or keyboard you learn to read two different clefs. Your right hand uses notes in the treble clef and your left hand covers notes in the bass clef. Beginners would usually first start to learn to read the treble clef notes and play using the right hand only. Playing keyboard in your school band can be quite different to the type of piano/keyboard playing you might learn in your private lessons. The function of the keyboard within our bands is mostly to play the bass line. This usually means a tuba or baritone part, always in the bass clef using the left hand. It is not common to play with both hands together in band. As band focuses mainly on the left hand, it is essential for students to have some keyboard experience before joining band. The piano is one of the most versatile and widely written for instruments. It has a huge range of notes and depth of sound. The piano is used heavily in classical music as well as jazz and rock. The modern piano as we know it began to take shape in the 1820s when virtuosic performers such as Franz Liszt and Frederic Chopin, who were rocks stars of their eras, played complex classical music. ‘Steinway’ is perhaps one of the most famous brands of pianos. Famous jazz piano players such as Herbie Hancock and Duke Ellington were innovators in the art of the jazz piano sound.